D.C. readers: Axios' Bob Herman and I are hosting a conversation tomorrow morning on the cost of innovation in the health care ecosystem. RSVP here. 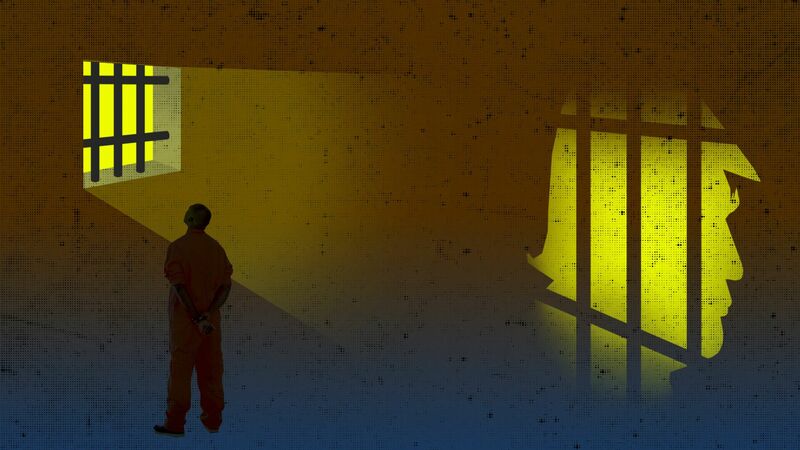 President Trump is enjoying a rare day of bipartisan accolades after commuting the lifetime sentence of nonviolent drug offender Alice Johnson, as Axios' Jonathan Swan scooped earlier today. Why it matters, via Swan: The pardon or commutation power is one part of the presidency that works as Trump originally conceived of the job. He, and he alone, can fix it — to borrow a Trumpian expression. Trump is largely bypassing the normal procedures for vetting these pardons and is open to hearing from friends, allies, and famous people he knows. Mic cuts a video about the plight of Johnson. Kim Kardashian West sees the video and takes up the cause. Kardashian visits Jared Kushner at the White House and drops by the Oval to see Trump. Between the lines: Jared Kushner has been working for months on prison reform and a bill recently passed the House, Swan notes. Kushner seizes on any opportunity he can find to popularize the issue — and to that end, Kardashian has been a powerful vehicle. 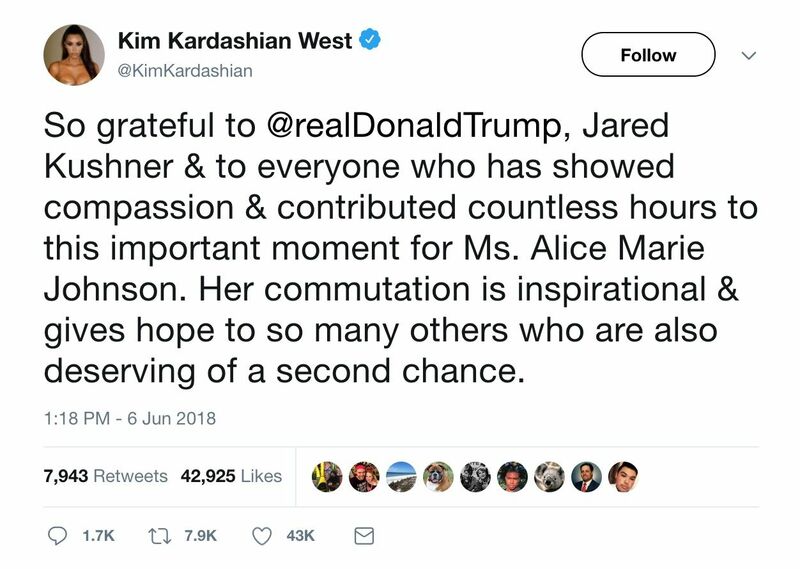 Johnson's daughter Tretessa told Business Insider: "The mercy Trump has extended towards my mom, and the advocacy of Kim Kardashian, my family will never forget that. Never." The big picture: As the NYT's Peter Baker notes, "The president’s intervention was contrary to the policies his own Justice Department has enacted since he took office. Attorney General Jeff Sessions last year ordered federal prosecutors to pursue the toughest possible charges and sentences against criminal defendants, reversing President Barack Obama’s efforts to ease penalties in nonviolent drug cases." Days ahead of a G-7 meeting this weekend in Quebec, many analysts say the U.S. is in an open trade war with its most steadfast allies. By the numbers. Multiple factors are raising the risk of Hurricane Harvey-esque storms in the U.S. and other parts of the globe. Go deeper. Trump's 2020 campaign manager wants a single, private, nationwide 5G network to boost mobile speeds and eliminate spotty service. Go deeper. Robert Mueller's team is reportedly requesting that witnesses turn in their cellphones to look at their encrypted messaging apps, including WhatsApp, Confide, Signal and Dust. Go deeper. Paul Ryan says he's "seen no evidence to the contrary of the initial assessment [Rep. Trey] Gowdy has made" dismissing Trump's concerns about "Spygate." Our look at the Trump claims. 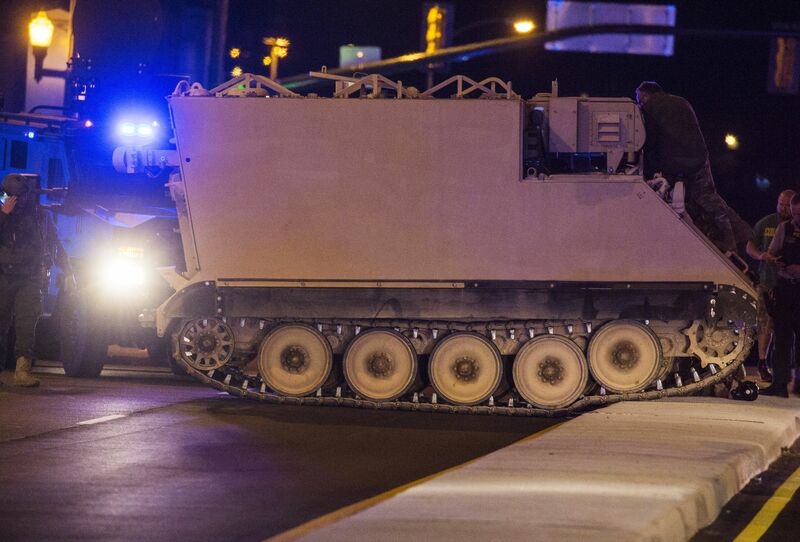 "Police in Virginia say they arrested a soldier who stole an armored personnel carrier from the Fort Pickett National Guard base and was chased by police for more than 60 miles," the AP reports. "State Police Sgt. Keeli Hill tells the Richmond Times-Dispatch the vehicle, which drives on tracks like a tank, topped out at speeds of about 45 mph (70 kph)." "Police couldn't stop it, so they ended up escorting it Tuesday evening, sirens blazing, before the man finally stopped and got out near Richmond's City Hall." the chief information officer from 2014-2017."